Enjoy the many benefits of an early morning yoga practice designed to start your day off right. We’ll center, stretch and build strength and stamina through warm-ups and yoga poses, and breathing and relaxation techniques. You’ll feel energized and, at the same time, calmly focused for a successful day. All levels welcome. Energize your morning with Yoga. The invigorating flow of breath and movement will rejuvenate your whole body and send you into your day feeling strong and balanced. The pace is suitable for all levels. Improve your strength, balance, flexibility and focus with this flow. A fun mixture of standing and seated poses will leave you feeling strong and enlivened yet calm and focused. 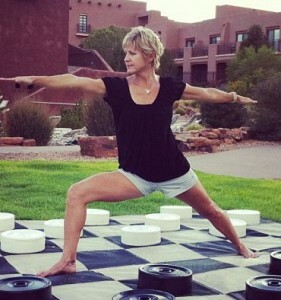 The Alignment-based flow class is suitable for all levels. Truly helps for a nice restful sleep!! The level Vinyasa flow is designed for all levels. We flow through basic postures that are linked with breathing to create an energy flow that moves from one pose to the next. This style is a balanced approach to core strength and broader focus is finding a deep inner strength that supports everything we do. We will practice traditional fitness notions of abdominal strength with awareness of developing a strong steady breathe and calm mind. Build your mind/body awareness and confidence which will give you the foundation for a strong and safe yoga practice. Melanie Butz will guide you through breathing techniques, proper alignment in basic yoga poses for YOUR body and YOUR range of motion, and relaxation in a non-intimidating and supportive environment. Start your weekend with a dynamic flowing class with emphasis on strengthening, flexibility and breath. This Class will challenge everyone participating in a fun and easy-going atmosphere. The time you take for yourself with be worth it! Private classes give the instructor and student(s) the opportunity to really get to know each other, and allow the instructor to gain a better understanding of student’s preferences, how their bodies work, as well as how to adapt to student’s personal challenges and help the student progress faster or relax deeper. We can design a class around your personal needs, from a gentle restorative class to advanced and challenging. Training in therapeutic adjustments help individuals correct improper alignment and achieve greater depth in their practice that they might not otherwise attain. Give us a call and let’s see what we can create. For groups of six or more. Do you have a group of friends, coworkers or employees that would like to practice yoga but would prefer to customize your own class and choose your own time and location? We can host private group classes. These programs are ideal for you and a group of your friends or for your business or family and make great teambuilding or bonding experiences. Rates for group classes vary depending on several factors including: supplies needed, time involved, number of participants, etc.